It’s not often that Australia gets something first! But somehow that’s exactly what’s happened with Stryd’s latest offering. After being a Kickstarter backer of the original Stryd Pioneer a year ago now, Stryd were kind enough to reward us all with early access to their second model – and mine arrived extra early. With an intensive 48 hours of testing the new unit under my belt – and now being stuck on a plane for twenty hours – the guys at Stryd asked me if I was willing to share my thoughts and my initial impressions about this new unit. So armed with numerous cups of really bad airline coffee and a copy of Microsoft Paint, lets dive in! After reading the Stryd Forum and seeing another Australian user mentioned his unit had just arrived, I walked downstairs to have my 4-year-old son excitedly run up to me: “Dad! There’s a package for you!” Even after all these years, receiving a package in the mail is like getting a present on your birthday. And this present just happened to be the new Stryd. With the assistance of an additional pair of eager hands, I pulled open the cardboard to get to reveal the new Stryd. The design is quite unique and has more in common with an expensive piece of designer furniture than your average piece of sporting kit. The curved concentric lines of the unit continue into the packaging and onto the new wireless charger. The Stryd crew have clearly departed from the somewhat boxier look of the Stryd Pioneer of a year ago. Inside the box is the foot pod unit itself, two shoe clips, the wireless charging base and a standard USB cable. The inclusion of two shoe clips is a nice touch. Stryd are obviously assuming (probably correctly!) that we’re all going to lose at least one shoe clip – so a second one is there at the ready. The clip simply slots under your shoe laces, you then place the wider end of the unit into the clip and press down on the narrower end until it clicks into place. The clip seems quite secure and knocking it around with my hand I was unable to get the Stryd to pop out. To remove simply press down on the exposed section of the clip and lift the Stryd up. It just looks… right – right? Bzzzt – clearly my credentials as a self-appointed tech-savvy user are mis-placed. That or Stryd’s design team simply put far too much effort into the underside of the wireless charging base! I posted about my “faulty” charger on the Stryd Forum. Within a few minutes one of the guys at Stryd responded at 11pm his time asking me to jump on Skype to help trouble-shoot the issue. There aren’t many companies you’ll get that level of support from! Fortunately, I realised my mistake before being embarrassed on a Skype call. To charge the unit you place it within the feint concentric lines on the flat-side of the base. The distinctive orange LED lights up as it starts charging. The cable is a normal USB plug that can go into any computer, USB hub or wall plug – or even a USB battery pack if you’re in a bind. After only 48 hours of use I obviously can’t give you an estimate of real life battery usage. With the unit securely on my shoe, it was time to put it through its paces (pun intended!). I tested the unit out with a Suunto Ambit2, Ambit3 Peak and Spartan Ultra – along with the Stryd app on my Android phone. I also ran some side-by-side comparisons between the new Stryd and the Pioneer. For all your Garmin people out there, I’m afraid I’m going to disappoint. As a die-hard Suunto user, I don’t own a Garmin to test with (although if anyone wants to donate a Fenix3…). Finally, I also threw in one of the Dynastream foot pods that many companies rebadge to compare the pace and distance measurements supplied by the new Stryd. In true Stryd fashion, the unit has plenty of connectivity options to maximise its compatibility with as many devices as possible. If you have a smart kettle I’m pretty sure there’d be a way to hook the Stryd up to it to measure something. The Stryd supports both ANT+ and BLE (Bluetooth Smart), sends power/cadence on the bike power profile and pace/distance/cadence on the foot pod profile. On my unit I did have an issue with cadence on the ANT+ profiles but given I was running the very first v1.0.0 firmware, one bug isn’t going to have me picketing the Stryd offices in protest and it will no doubt be addressed shortly. Cadence was fine on the BLE profiles, although like the Pioneer it’s in spm (steps per minute) rather than the rpm (revolutions per minute) that Suunto users will be used to. Unlike the Pioneer, the new Stryd obviously doesn’t send heart-rate and the neat trick the Pioneer has of re-purposing cadence in the foot pod profile as power to really maximise compatibility options has been replaced with actual foot pod pace/distance/cadence measurements. The BLE-compatible Suuntos (Ambit3 and Spartan) are currently only able to pair and connect to one profile on a device at a time. This means you need to choose either the power pod or the foot pod functionality – not both. 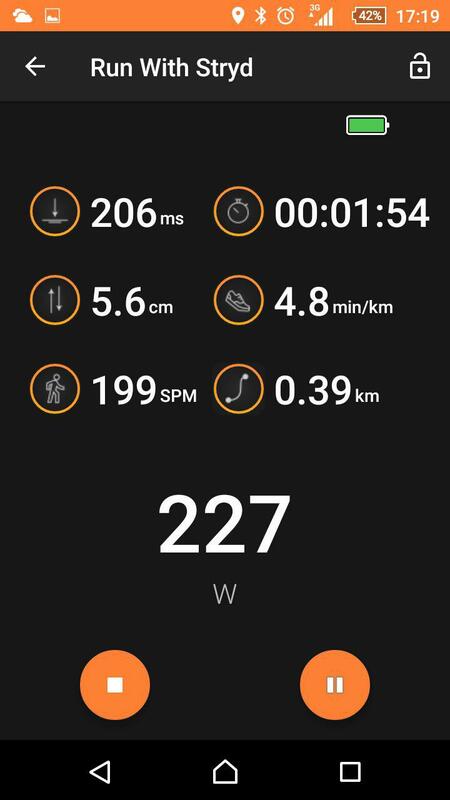 Suunto dealt with this via a firmware update upon the Pioneer’s release by having the user pair it as a heart-rate pod and then the watch would silently connect to the bike power profile and take only power. I wouldn’t be surprised to see something similar appear with the new Stryd so you can use both the power pod and the foot pod functionality. The older Ambit2, which uses ANT+, has no problem connecting to both profiles at the same time. I also updated and then paired the Stryd with the Stryd app running on my Android smartphone to set my weight and height on the unit. The app is available in both the iOS and Android app stores and requires you to register an account with Stryd. This step is necessary for the Stryd to calculate your absolute power rather than simply a comparative number. Unfortunately, I haven’t yet managed to re-do a Critical Power test with the new unit. I know – I was devastated. Who doesn’t love a run that leaves you feeling nauseous?! The first thing I noticed with the new Stryd is that it’s noticeably more responsive than the Pioneer. Given one of the selling points of running power is that it measures the physical load your body is under rather than waiting for your heart-rate to respond to that load, this increased responsiveness is definitely a positive. 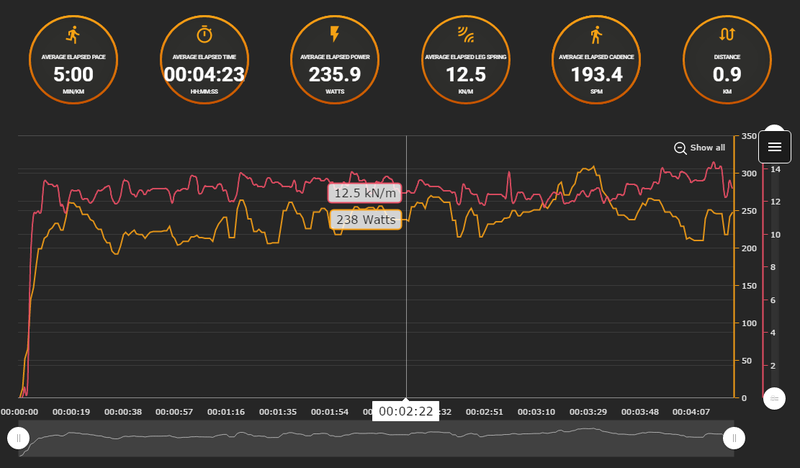 I was only sync-ing the new Stryd to Stryd Powercenter via the app, so I’ll need to revert to Suunto Movescount to demonstrate the increased responsiveness compared to the Pioneer. I did my short hill repeats session with the new Stryd sending power to my Ambit2 and the Pioneer sending to my Spartan. The two graphs below show power vs time of one of those repeats. They start with the slow downhill recovery jog of the previous repeat, turning around, immediately starting to sprint and then the start of the next downhill. You can see the new Stryd is clearly more responsive as I turned around and started sprinting. On average, it responded in approximately 66% of the time the Pioneer took to respond. You’ll notice I haven’t yet calibrated my Pioneer – hence a difference in the raw power and the average that’s drawn as dotted horizontal line. Apparently wearing the Pioneer in different positions can impact the power calculation and Stryd have recently included a feature in the smartphone app to calibrate the unit. Without calibration for your preferred position the numbers are still perfectly useable as a comparative measure, but – like setting your weight – may not be absolute. Check out this email for the full details. The other improvement I noticed was the new Stryd’s response to wind. Both units have a barometric air pressure sensor in them to help measure ascent and descent to help with power calculations. A drop in air pressure means you’re going up – an increase means you’re going down. Unfortunately, wind hitting my chest also creates a pressure increase on the Pioneer’s sensor, fooling it into thinking I’m now running downhill and artificially dropping my displayed power. The new Stryd is still impacted by strong winds, but the impact is noticeably less. Turning a corner on my 45min moderate run and hitting a fresh breeze I noticed the power drop on the new Stryd was generally about 30-50% of that on the Pioneer. Likewise, when the wind dropped off the rebound increase in power was noticeably less on the new Stryd. And yes, I got a few strange looks from passers-by as I ran along with both elbows sticking out with my eyes glued to the two watches held up in front of me! As with the Pioneer, your run data can be loaded directly into the Powercenter web app via the smartphone app or via your watch of choice (including Garmin Connect and Suunto Movescount). Using a GPS watch or recording your run with the app (which obviously requires running with your phone) adds the benefit of a GPS track. Sync-ing with Movescount I was able to pull the power details across from my 45min moderate run into Powercenter. I then sync-ed the Stryd via the app which automatically combined the two sources of data and added in the Stryd-only metrics of Vertical Oscillation (VO) and Ground Contact Time (GCT). VO and GCT from the Stryd aren’t currently recorded by any watches on the market (although the Garmin HRM-Run pod does generate the same metrics for Garmin users). 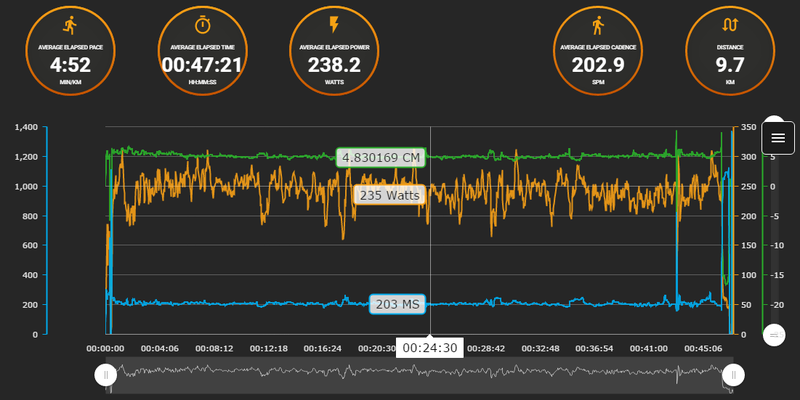 Users of both the Stryd Pioneer and Garmin HRM-Run will be familiar with these two metrics which, along with cadence, are useful for measuring your running form. A high vertical oscillation suggests you’re bobbing up and down too much, wasting energy in vertical movement rather than putting it into horizontal. Along with cadence, these metrics can also be useful in determining where you’re fatiguing and losing your form later in an endurance run. Comparing Tuesday’s run when fresh with the second half of Wednesday’s second run, I was able to see clear signs of fatigue and a drop in form. The new Stryd goes one step further and adds an additional metric in the form of leg spring (or stiffness), measured in kN/m. I was only able to see this metric by recording my run using the Stryd app – sync-ing the Stryd via the app after a run didn’t generate it. I wouldn’t be surprised to see this updated in a coming firmware/app release as the Stryd crew are pretty good about presenting us with every possible option. So, what’s leg spring and what use is it I hear you ask? Sorry, but I don’t have an answer for you yet! I ran out of time to really research this new metric and work out how it can be useful. The collaboration that occurs on the Stryd Forum is a great asset and I wouldn’t be surprised to start seeing discussion and different uses around this new metric shortly. A side effect of what is essential a set of very smart accelerometers attached to your foot is that the Stryd is measuring your foot’s movement in 3-dimensional space. This in turn allows it to measure your speed/pace, distance and cadence and present them to you via the standard ANT+ and BLE foot pod profiles. But foot pods are those clunky things we used to stick on our running shoes back before GPS watches became available, right? Well, not entirely. 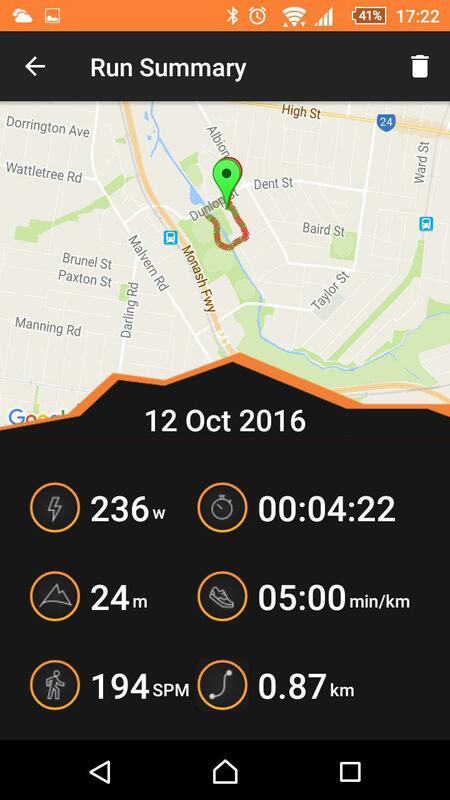 I often do my 13km run home from work as a snowball – increasing it by 5s/km every 1km until my final km is at a pace I can barely maintain. Good times! However, my run home takes me under numerous bridges, underpasses and hangs under a freeway for a good portion. Even the Suunto Ambit3’s GPS struggles to give me accurate pace when there’s a foot of steel and concrete above it. Enter the foot pod. Calibrated properly, it will beat my GPS watch when it comes to accurate pace in challenging GPS environments. But the new Stryd seems to take the foot pod’s accuracy to a whole new level. It doesn’t require any calibration to give very stable pace and accurate distance measurement. My testing obviously wasn’t exhaustive, but on a flat road run I found the accuracy and stability of pace data was clearly best from the Stryd, followed by my calibrated Dynastream, the Suunto Ambit3 and finally the uncalibrated Dynastream. But the other exciting thought is that this provides accurate measurements off-road. The Dynastream’s accuracy tends to fall away once you get outside the running conditions you calibrated it in and fall even further when you take it onto the trail. The Stryd shows a lot more potential off trail. Accurate pace is generally of limited use for trail running, but one application would be for 100km+ events where your GPS watch battery may not last the distance: turn the GPS accuracy down to make the battery last the distance while still recording a semi-accurate track, but continue getting accurate distance measurements by using the Stryd. Unfortunately, I didn’t get enough time to truly test the accuracy of the Stryd’s distance measurements on trail. Check out the Stryd Forum where I’ll share the results of testing at a race in a couple of days’ time – and other users have already planned to share their own testing. Despite the length this “initial impressions” review has turned into (thank you aircraft coffee!) I definitely feel I’ve only briefly touched on everything the new Stryd has to offer. So far it looks like the crew at Stryd have taken their learnings from the ground-breaking Pioneer device and improved on them further with the release of the new foot pod design. And no doubt we’ll continue to see improvements in the form of firmware and software updates. Join me on the Stryd Forum or in the Stryd Facebook group where I, many other enthusiastic Stryd users and the staff at Stryd happily hang around sharing our thoughts and answering questions.